Victor Love is the mastermind behind long running industrial-cyberpunk-rock and rollers Dope Stars Inc. Outside of his work with that project, Victor love is a prolific artist, producer and musician, having also released music with the orchestral/anthemic/industrial crossover project Epochate and the electronic-post-industrial side project Hacking The Wave, remixed such artists as KMFDM, Deathstars, Suicide Commando, 3TEETH, Funker Vogt, Mortiis, L'ame Immortelle, ASP and Emilie Autumn, and had music on the soundtracks for 3 movies of the SAW series. 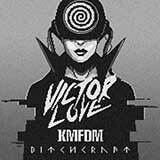 With his new eponymous solo project, Victor Love explores various aspects on his musical range and experiences, creating a sound that is a crossover of industrial and dark electro, healthy doses of cyberpunk, cryptowave, distorted beats, obscure leads, synth guitars, and absolutely no fucks given. 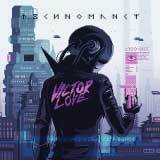 His debut album Technomancy is conceptually centralized around the vision of a dystopian future and the effects of advanced technologies on hyper connected societies were virtual realities merges with reality in a setting where techonlogy have become indistinguishable from magic. Everything is wrapped up with an exceptional design & artwork by pixel artist Valenberg.